The original report`s layout have been preserved as much as possible - i.e. 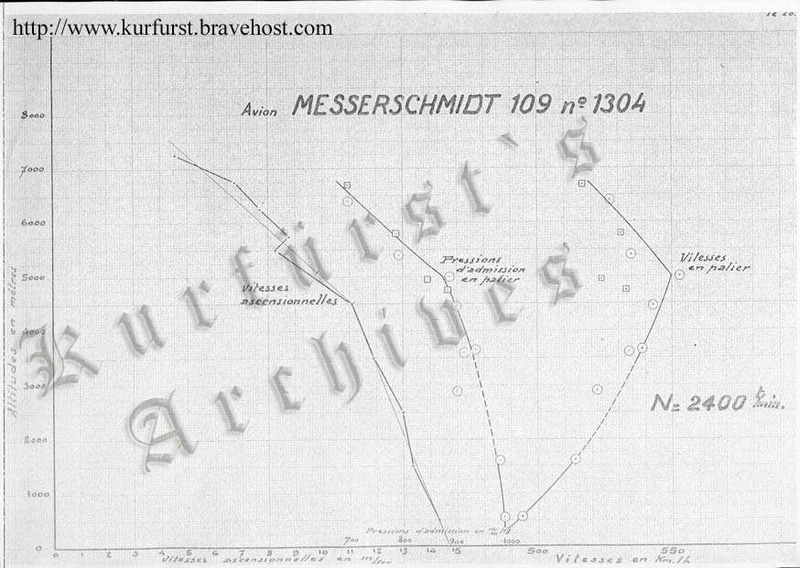 the inaccurate reference to the manufacturer as 'Messerschmidt'. Some French expressions, and names of organisation and ranks were also kept for the sake of easier reference without hindered by clumsy attempts to translate them into English. The author begs the dear Reader to overlook the possible errors and welcomes any and all corrections and suggestions, especially concerning spelling or translation mistakes. Email at kurfurst@atw.hu. Special thanks must be expressed to Romain R. for his translation. Proof-reading, editing and hosting by Kurfürst. Tactical trials against French fighters were performed later on with the same plane; see HERE. Attached Graph in the Rapport. Climb (calculated from climb times). Manifold pressure in level flight and Speed in level flight. 12/ 6/39 - Aircraft arrival at the Center. 7 to 12 December 1939 - Reassembly, equipping and identification. 12/13/39 - Undercarriage rolling test. 12/14/39 - Tanks emptying and filling with: ( 'C' fuel of 92 octane. ( by replacing original components). 12/15/39 - Engine measurement on test bench. 12/16/39 - Finishing the aicraft setup - roundels painting. 12/18/39 - Instruments inspection by the Center`s pilot. 12/19/39 - Equipment verified during flight. 12/21/39 - Radios tuned on ground. Searching for optimal climb angle. Thus 7 flights, 5 hours of duration in total. The performances have been achieved in a "day combat flight"
setup, this means a weight of 2540kg (centering undertermined). full throttle, with propeller pitch giving 2400rpm. The climb has been interrupted at 8.300 m. due to malfunctioning of the engine. coolant liquid and oil temperatures. - The second one from 5000 to 7000m, with radiators closed. denuded by assuming that the antenna coefficient was equal at 0,1. 2 to 3%. Thus maximum speed is 570km/h +/-15km/h. Manifold pressure = 840 mm. Rotation per minute = 2200 R.P.M. ters (available fuel quantity = 400 liters). the optimal speed before the climbs done on the 12/23/39. formance and the obtained performance. The climbing was done at the Center with the radiators open up to 4000 m.
used by the German tests could permit climbing with closed radiators. (1) - Oil and cooling liquid. combat qualities of the tested aircraft. Governmental Spain, with the Report 55/S). Climb angle is very steep, the pilot doesn't see anything in the font. He sees the ground by the rear. Elevators reaction change with speed variations are significant. All movments in the vertical axis require a compensating manaouvre. full throttle at low speeds. - the difficulty to succeed in a shot when nose up. The rudder is effective, but the engine torque is very badly compensated. foot is quite strong to oblige the pilot to hold the plane with the ailerons also. It is very difficult to turn on the right while in a climb. Fuel - by filling under pressure - fast. Oil - normal filling, opening at the upper-side of the tank. -ment on the control panel. magnetos which are not removable as long as the cowl guns are at their place. pipes within the engine. Those pipes are protected by a "besano" girdle. cipated and simple to remove. The installation has been designed to enable rapid removal of the engine. The pipes connections vith fittings that enable rapid removal. culties in operating the plane. The installation of the 1100 H.P. D.B.601 engine transformed the plane. The thus obtained aircraft is robust, very well achieved; it has high performance; However,the engine torque is badly compensated. a turn to the right and in a climb as the best maneuver. Last updated 23 July 2006.